The construction on this project has now been completed. existing Marlton Circle at routes 70 and 73 in Evesham Township, Burlington County. The project will improve traffic flow and reduce accidents at the intersection. Route 70 and Route 73 are state highways that link Burlington County to Philadelphia, South Jersey suburbs and the Southern Jersey shore areas. Locally, Route 70 and Route 73 are east-west and north-south connectors to nearby county and local roads providing access to adjacent properties and businesses. 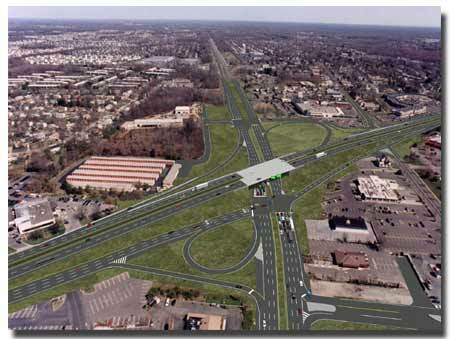 includes road improvements such as a grade separated interchange at the intersection of Route 70 and Route 73, which will allow Route 73 to carry traffic above Route 70 using ramps as connections. New traffic signals will be provided on Route 70 at the Route 73 northbound and southbound ramps and at the intersection of West Main Street with a ramp from northbound Route 73. 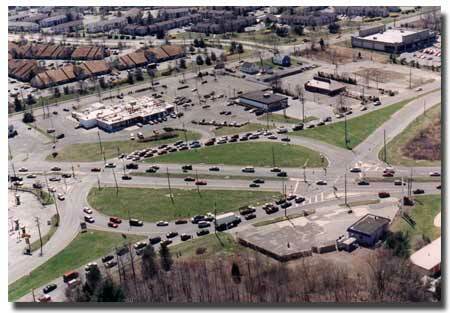 The aerial photo above is of the existing Route 70 and Route 73 Marlton Circle with a rendering of the proposed Route 70 and Route 73 Marlton Circle Elimination Project shown below.